At the top of the window, the caption bar contains the document's filename and standard OS controls (via the pop-up) to rename/move the file. The file icon if Cmd-clicked shows the path to the file's stored location from root. Below the caption bar, and hidden by default is the toolbar. Below the toolbar, also hidden by default, is the (OS 10.12 onwards) document tab bar. Beneath these, and visible by default, is the main toolbar and link lark. 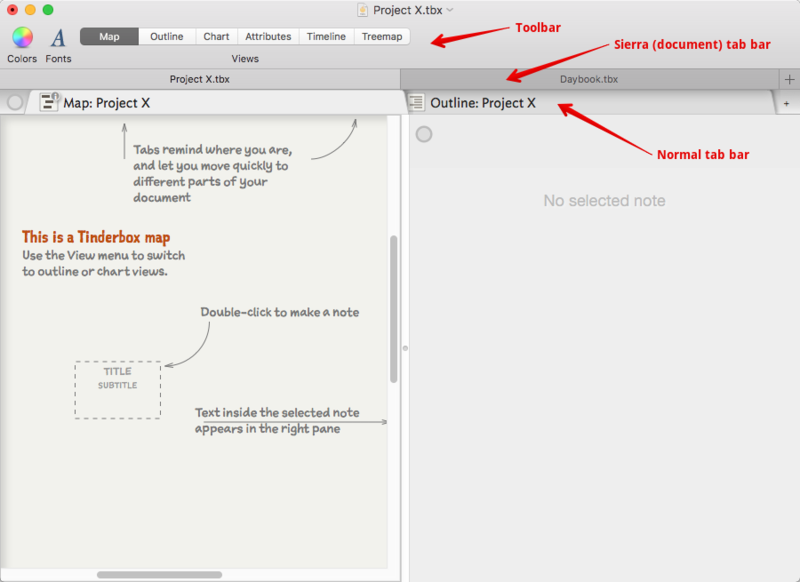 A Tinderbox document window will always contain a minimum of one (view) tab. By default new blank windows open with two tabs; the second tab may then be closed or additional tabs opened as required. Beneath the tab bar the window is split into 2 halves by a (moveable) splitter bar. The left side forms the 'View pane', holding a view such as a Map or Outline. This pane equates to a major view type window in pre-v6 Tinderbox. The right side of the window is used for the 'Text pane' and which equates to a text window in pre-v6 Tinderbox.